Remember when you were a teenager (especially junior high) and all you wanted to do was fit in? Have “normal” clothes that everyone else had, hair that everyone else had, perhaps Bonnie Bell lipsmacker or a shirt with a little alligator on it? Maybe a pink streak in your hair or an all-black wardrobe (depending on your social circles)? OK, maybe you weren’t like that — maybe you were mature enough or independent enough or smart enough not to care about superficial stuff like clothes and hair and accessories. Maybe you were always an original. I was none of those things. I just wanted to fit in — and I didn’t, but that didn’t stop me from trying. Now, at post-middle age (unless I live to be quite old, at which case I am still middle-age), I think I’ve finally achieved it — I fit in with my peer group. In fact, when I’m out and about these days, in the places where middle-class suburbanites go, I see me. 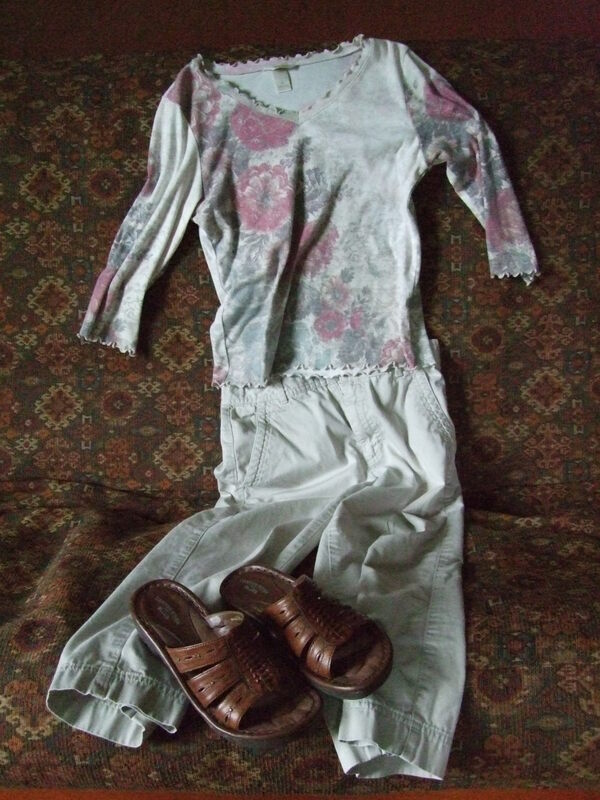 Women of a certain (middle+) age, wearing virtually the same clothing (capris because, hello, no way we’re wearing shorts), sandals, a top (sleeveless or tank, if the arms can handle it, or a colored tee or maybe a peasant-type top). We have one of a couple hairstyles…mostly short, mostly the same few colors (because there really aren’t a lot of choices on the shelf), mostly trying to hide the fact that we have much less hair than we used to. We all get called “ma’am” regularly, and while we still don’t like it, we’re used to it. Most of us get called Mom. Some of us even get called Grandma. When we’re with a man, he’s likely gray, slightly paunchy, wearing the standard guy uniform of something khaki with some kind of golf or tee-shirt, and sandals, tennies, or loafers. Looking back, I think this trend toward homogeneity starts in one’s 30’s and just keeps getting stronger — right up until we’re all wearing stretch pants (not the good kind) and big flowery blouses and sensible shoes. I was reading an article in Pitt’s alumni magazine the other day about a group of college friends who stayed friends for 40+ years. And yes, in their group picture, posing with their wives, they all pretty much looked alike. I’m mostly OK with it — there’s comfort in sameness. Security, even. Belonging. It’s probably why I always wanted to fit in, to have a place in the crowd. Now I do. I’m middle-age-ish woman No. 42,239,471. Smile when you see me — everywhere. It’s sad to grow old, but nice to ripen. you described me, my outfit, my shoes… the “ma’am.” and worse, I am a mom who must appear with her young son and the CHILDREN who also have kids my son’s age. the nerve of these youngsters. how dare they reproduce?! they probably think I am his grandma. and I could be. alas–don’t care as much as I would have cared, years ago. I have not the time nor the energy to exert in such trivial pursuits.